Unusually detailed mapping of the Straits of Malaca. Carte de L'Isle de Sumatra. 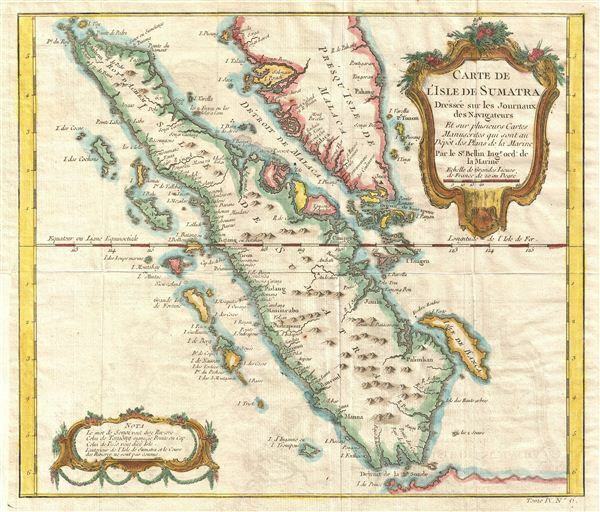 This is J. N. Bellin's 1749 map of Sumatra and the southern portion of the Malay Peninsula. This is an unusually detailed map of the area, showing many coastal features, shoals, banks and small islands. The Straits of Malacca and the Detroit de Sincapour and finely detailed. Singapore Island is not specifically named, but it is shown, and several other lesser islands are named including Tioman Island, Banca, and Penang, plus many off the west coast of Sumatra. The cities of Palembang, Jambi, Manimcabo, Aceh and Batang are located, but not Medan is curiously not identified. A legend lower right gives the local terms for rivers, capes and islands as well as advises that the interior of this region is largely unknown. At lower right below neatline is 'Tome IX. No. 6,' identifying this map as coming from the ninth volume of Abbe Provosts, Histoire Generale Des Voyages. Provost, A., L`Histoire Generale des Voyages, vol 9 (Paris) 1749. Very good condition. On thin paper. Original fold lines.